Do you have a room in your home that isn’t living up to its potential? I would say most of my friends and clients do. 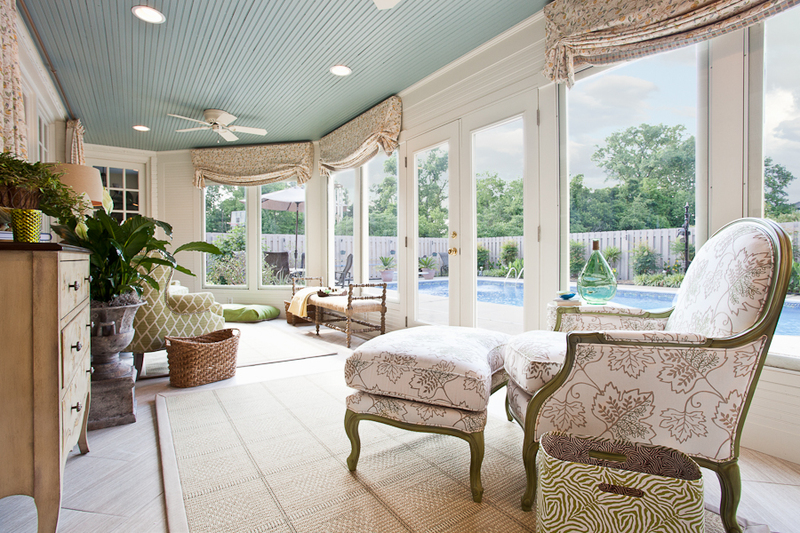 One recent project had a new client asking me what I could do to her tired sunroom. She was using it as a make-shift greenhouse for her plants rather than a room for her family. She wanted it to look and feel like a retreat where her family and friends could relax and unwind. The sunroom was a 20-year-old addition to a 30-year-old home. The square footage was considerable—almost 250 square feet—but the layout was awkward. The room’s dimensions are 25 feet long by only nine and a half feet wide. This created a real dilemma when laying out furniture. You can’t put a sofa and chairs across from each other with only a 9’ footprint. When you have a long, narrow room it’s best to create two distinct seating areas. For one seating area, the dominant architectural feature was a 10-foot span of windows from the interior living room. So, I used this as a focal point, centering two wing chairs flanking a bistro table, framed by decorative drapery panels. This is the primary seating area. In order to have seating across from the wing chairs, I nestled in a small bench, allowing for easier conversation. And, you can see over it to the view of the pool. On the other end of the sunroom I placed a single French style chair with an ottoman for my client to nurture her love of reading. Centered on the wall behind, I placed a round mirror. This accomplished two goals, softening rectilinear nature of the skinny room and visually pushing out the wall to add to the sense of space. The client was so thrilled with her new room. Never could she have imaged such a dramatic transformation. Instead of a resting place for lonely plants awaiting the arrival of summer, now it is an oasis where she and her family can rest and enjoy every season.